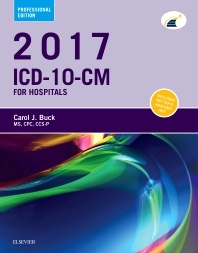 Select diagnosis codes accurately with Carol J. Buck's 2017 ICD-10-CM for Hospitals: Professional Edition. Designed by coders for coders, this full-color manual includes all the ICD-10 codes needed for today’s inpatient and Medicare coding. As coders need extensive knowledge to code with ICD-10-CM — and to choose from the thousands of possible codes — this edition provides an essential background in A&P, pathology, and medical terminology, along with colorful Netter’s Anatomy illustrations and clear instructions for using the book. Together with the durable spiral binding, these features make professional diagnosis coding faster and easier. A companion website includes the latest coding news and updates! Hospital Acquired Condition symbol clearly identifies conditions that are considered reasonably preventable and may prevent the case from grouping to a higher-paying MS-DRG.